Posted June 5, 2014 in Uncategorized. The Red Skull is one of comicdom’s most potent villains. Sinister yet vaguely comical, the character was introduced in Captain America’s first issue in 1941 and has endured for more than sixty years. 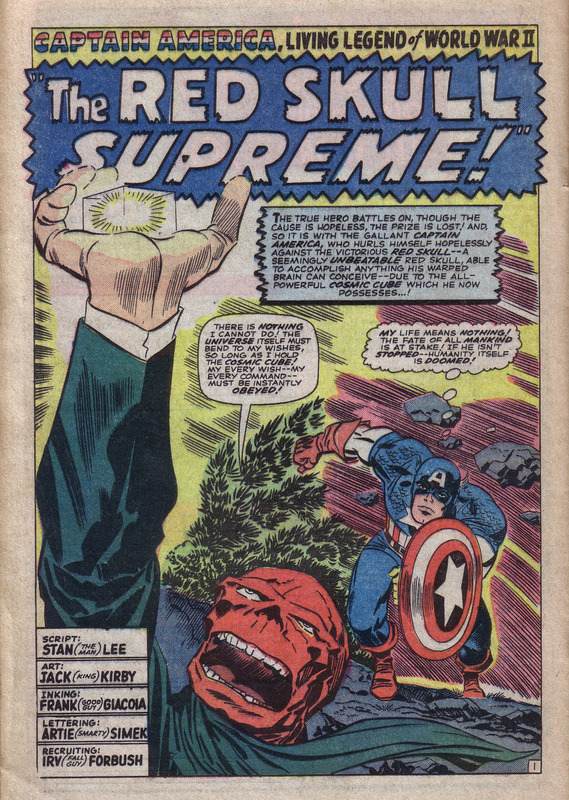 When the Red Skull was reintroduced to 1960’s Marvel readers, the comics code was still in full swing, although waning slightly in power. Still, the Skull had to be re-drawn to diminish his fearsome visage. Jack Kirby made the villain somewhat less frightening by making his fleshless teeth less prominent. When Marvel reprinted 1940’s Captain America episodes in a magazine called Fantasy Masterpieces, it featured two tales from issue #3. The Skull actually appeared in the issue’s first story, but one can only surmise that it was deemed unacceptable. The splash panel from that story, shown above was a grisly scene that would not have passed through code inspection. Not only was the Red Skull’s leering visage prominent, there were also two corpses dressed in our heroes’ costumes hanging by their necks. 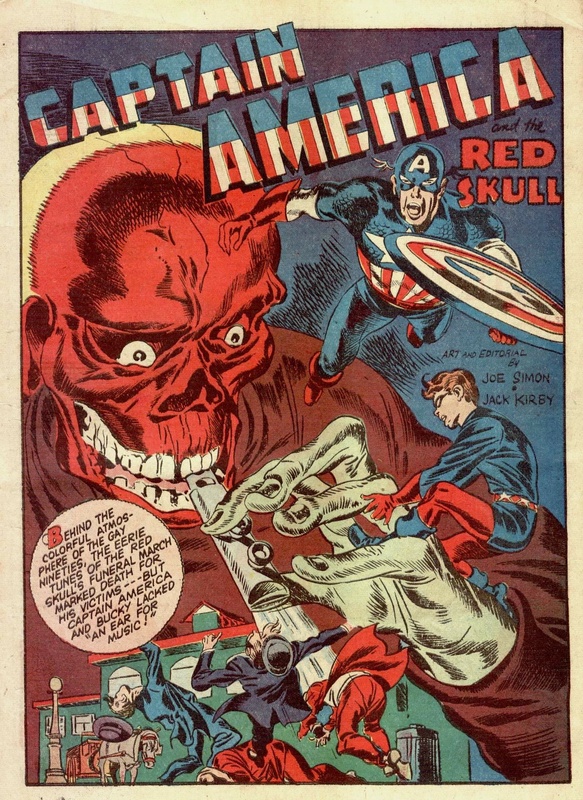 Marvel eventually did print a Red Skull appearance from Captain America #7 and the villain’s face was redrawn awkwardly by someone other than Kirby, which had the comical effect of making him look more like the Red Frog. Here is the wonderful, original version of the splash from the story above. I don’t have a copy of the reprint and after all, it would be a shame to post it instead of this grotesque beauty. 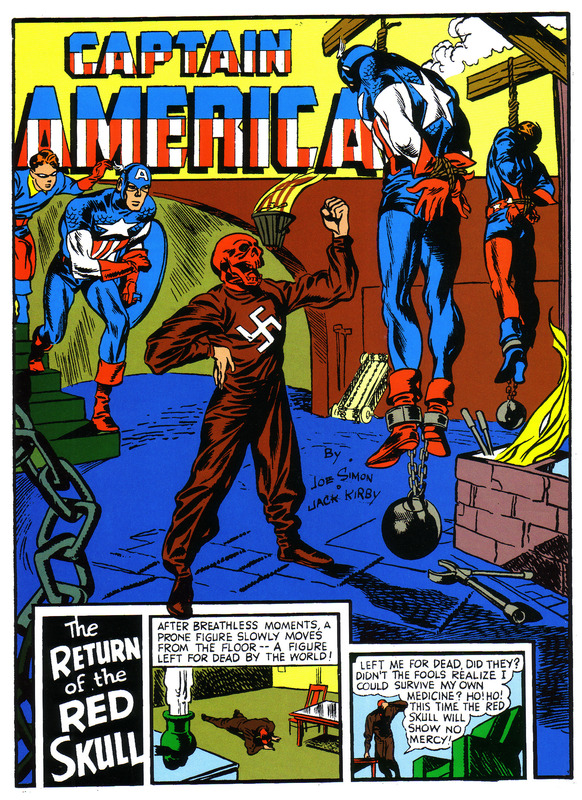 This Captain America/ Red Skull story from Tales of Suspense #81 show’s the fiendish Nazi at the top of his game, having acquired a potent weapon known as the Cosmic Cube. This magnificent Kirby splash page, deftly inked by Frank Giacoia shows Captain America in all his dynamism and the Red Skull in all of his fearsome menace. In this composition, the eye first makes contact with the cube, travels down the Red Skull’s arm and back up and rightward from his head to Cap’s charging figure. Cap’s arm and the force lines bring us back to the Cosmic Cube. 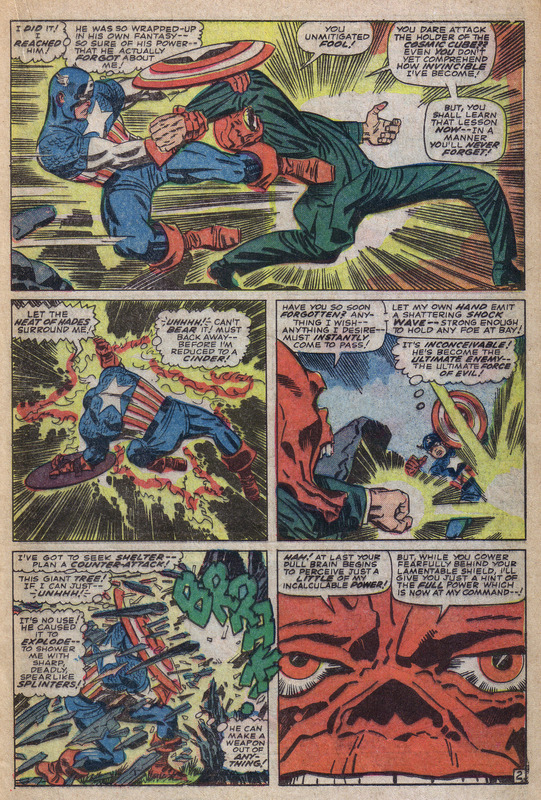 On the following page below, Cap jackknifes into the Skull’s slim, nimble and rubbery body. His trajectory is a perfectly placed triangular wedge that offsets the Skull’s twisted unbalance. The story is from what many consider to be the height of Kirby and Lee’s creative arc. Dated September 1966, the issue would have occurred in the same period that the team was doing the Fantastic Four run from issues 48-60, unquestionably a peak of creative brilliance. Good to see the Red Skull have a piece of that glory. By the way, the Cosmic Cube seems to have made it into the modern film versions of Captain America’s saga. It is known as the Tesseract.